Fear the non-beard! Famed photographer Matthew Brady shot this the day of the speech. Seven score and fifteen years ago, Abraham Lincoln gave what was then the biggest speech of his career, and he gave it in New York City, at Cooper Union. Originally slated to speak at Rev. Henry Ward Beecher’s church, Lincoln was redirected by the Young Men’s Republican Union to a fairly new institution, Cooper Union. The college had been founded by Peter Cooper, glue industrialist, Jell-O inventor, and namesake for those buildings next to Stuy Town that look like Stuy Town. Cooper was a prominent Democrat, but with the party split over slavery, he was happy to host a leading abolitionist in the newly built Great Hall. A crowd of 1,500 gathered to hear the curious Illinois lawyer turned failed politician. The speech is notable for its argument that the Founding Fathers, both in principle and in their personal views, would not have supported expanding slavery into new states. Lincoln then engages in a prosopopoeia, an incredible word that I’d never seen before last night. It is apparently a rhetorical device in which the speaker provides both sides of the argument. 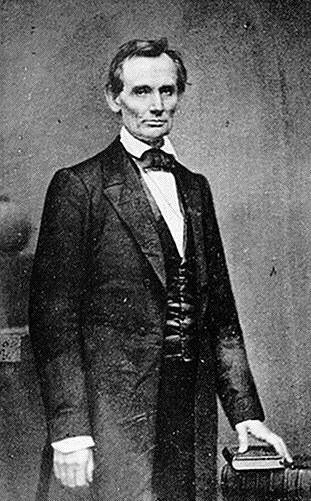 In this instance, Lincoln engages in a debate between himself and his Southern critics on the constitutionality of slavery, a contest that he wins handily. The speech lacks the poetic quotables of future Lincoln addresses, or even the folksy anecdotes that typified his campaign (like his 1861 visit to New York). Yet the moral principles are unmistakable. Lincoln does not believe that the Union and the South can coexist because of the latter’s absolute insistence on continuing and expanding slavery. The speech was a monster hit. Most of the city newspapers ran the entire text the next day, which was then common for important addresses. Horace Greeley’s New York Tribune wrote, “No man ever made such an impression on his first appearance to a New York audience.” For the first time, Lincoln discussed as a presidential contender, and that summer he won the Republican nomination, defeating a field that included New York Governor William Seward. Seward went on to serve in President Lincoln’s “Team of Rivals” administration as Secretary of State, achieving infamy for “Seward’s Folly,” the purchase of Alaska for $7 million, which is less than a third of what the Knicks paid Amare Stoudamire this season. Cooper Union’s Great Hall has played host to Barack Obama twice, a campaign event in 2008 that felt like a historic bookend to Lincoln’s, and a call for financial reform in 2010 that he probably hoped would be more historic. I was at the 2008 speech: it was my job to stand in front of the side door to make sure the hallway light didn’t distract or cast a glare on the future president.